We’ve all met the fate of dead or dying batteries, whether in a simple remote control or a high-end digital camera. If you find yourself regularly replacing batteries in your electronic devices, then perhaps it’s time you moved up to rechargeable batteries. Not only can you stop throwing disposable batteries into landfills, but you can save yourself some money as well. And in the case of today’s high-powered devices like digital cameras, the latest rechargeable batteries will give you more power (and thus more shots) than disposables. From the research I’ve done, the Sanyo Eneloop, PowerEx Imedion, Uniross Hybrio and Kodak Pre-Charged are all good choices for batteries this type. While the Eneloop is the original low self-discharge battery and still considered the king by many, the Hybrio (see test results) and Imedion (see test results) have a slight edge in capacity over the Eneloop for most applications. However, it has been shown that the Eneloops perform better (at least compared to the Imedions) in high-drain applications, such as in a high-powered flashlight. A relative newcomer, the Kodak Pre-Charged batteries may beat them all, with one Amazon review noting that the Kodak Pre-Charged batteries actually tested closer to 2200mAh, which is 200mAh higher than Eneloops. For most people, the performance differences amongst these different brands are small, so I suggest getting whichever batteries have the best price. The Eneloops are easy to find being readily available at Amazon and eligible for their Free Super Saver Shipping. You can get the Kodak Pre-Charged batteries as well, though they may not be eligible for free shipping. Eneloops Re-branded: As alternatives, the Sony Cycle Energy batteries are in some cases just re-branded Sanyo Eneloops – and sometimes priced cheaper (though I’m personally not a Sony fan). Also, there is evidence that some Duracell Pre-Charged (a.k.a. ActiveCharge in Europe) batteries are re-branded Eneloops. In either of these cases, the way to tell if they are Eneloops is to check the package and see if they are made in Japan, and to check if there is a white ring around the positive terminal (as opposed to grey or black). These might be a good solution if you can’t wait for batteries to be shipped to you and want to buy them in a retail store, where you can check out the actual package – but you’ll likely pay more than you would for genuine Eneloops. Deal Notice #1: The PowerEx Imedion batteries are available from PhotonLight.com for $13.95 with very reasonable shipping ($2.69 for me) but have a look as they often have free shipping promotions. This company is a well-known seller of the Photon Freedom Micro-Light (an amazing keyring LED light) found at REI and other outdoor stores, and you can rest assured it’s a reliable dealer. If you only need one set of batteries, which isn’t enough for free shipping at Amazon, then this may be the best deal. Deal Notice #2: Amazon is currently selling Duracell Pre-Charged Batteries at great prices for both the AA and AAA 4-packs (under $10 each at the time of writing). Additionally, you can get an extra 15% off with Amazon’s Subscribe and Save feature which should also get you free shipping (you can cancel the subscription at any time). Numerous people have reported that the AA cells they’ve received from Amazon have been re-badged Eneloop batteries, making this a fantastic deal on great batteries. While these low self-discharge batteries are fantastic in terms of holding their charge, if you are regularly replacing or recharging batteries on a weekly or daily basis, then I recommend some standard high-capacity rechargeable batteries instead. The low self-discharge batteries have a maximum capacity of 2000 to 2100 mAh (Milliamp Hours), but the latest standard rechargeable NiMH batteries are available with a maximum capacity of 2700 mAh – about 30% more power than the low self-discharge batteries. The catch is that after anywhere from 2 to 4 weeks of sitting around, that 30% extra power is lost, so they’re really only a smart purchase if you know you’ll be using them extensively within 2 weeks of their charge. If you decide you need that extra capacity, my research shows that the Maha PowerEx 2700 mAh AA batteries are the best in the class. While you may see batteries advertised with a higher mAh rating, such as 2900 mAh, what you see is not always what you get. In terms of tested capacity, the PowerEx 2700 batteries are the highest capacity batteries you can get right now (2734 mAh tested). They’ve also been shown to retain their charge better than other similar batteries, which is good just in case you don’t use them within the first couple weeks of charging. Alternatives are the Ansmann 2700 mAh batteries (2696 mAh tested) and the Sanyo 2700 mAh batteries (2624 mAh tested) at 2nd and 3rd respectively. However, note that the Sanyo batteries were tested as losing almost 50% of their charge after 28 days. 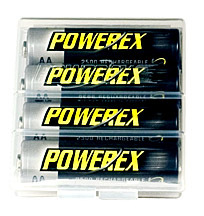 Since they all cost more or less the same (about $14 for a 4-pack) there’s no reason to get anything but the PowerEx batteries if you need the highest capacity batteries you can get. For the best deal on the PowerEx 2700 mAh batteries, look on Amazon where the usual price is $13 per 4-pack and there are usually free shipping options. If there are a no free shipping offers there, the next best deal is at PhotonLight.com (see above for my comments on their good reputation). They usually have them for $13.95 with shipping under $3 ($2.69 for me) – but they often have free shipping promotions which you’ll see on the homepage. Remember, after 2-3 months of sitting around, standard rechargeable batteries will have lost most or all of their power, and you’ll need to charge them first before getting any significant use out of them. For this reason, if you’re going to get only one set of batteries, I recommend you get low self-discharge versions such as the Medion, Hybrio or Eneloop batteries. The other advantage of these batteries is that they come pre-charged and ready for use right out of the package, though it’s still best to charge them first if you can to get the maximum capacity. Any of the above batteries can be charged with a standard NiMH battery charger, however, not all chargers are created equal, and so check out are my recommendations for the best AA battery charger (with travel and portability in mind). Questions or comments? Feel free to leave a reply below. i have some Delkin AA that are 2900 mah…..CTA probably also has 2900 mah AA’s now….Thomas Distributing is a good source for nimh batteries and chargers.. I haven’t yet seen any reviews of the Yuasa Entime AA batteries and I’m a bit skeptical to try them given that I’ve never heard of them before. There are some tests on the Yuasa Enitime AAA batteries at CandlePowerForums. If anyone is interested in trying out the Yuasa Enitime 2500mAh AA pre-charged batteries that Andrew is referring to, they can be found at Amazon. We can all quibble over small performance advantages, but the fact is this new type of battery is a great improvement even over the old NiMH. Can these new NiMH batteries be used with the older generation NiMH chargers? Thx. Good info here.